Shree Bhagwati (1996) is a leader in manufacturing machinery for chemical, pharmaceutical, cosmetic, ayurvedic and herbal industry. Our best labeling machine have included ourselves in the manufacturing and labeling procedure of various ventures like food, pharmaceutical and beauty care products that require wide scope of labeling like Round, Flat, Oval, Square, Top, security seal according to the prerequisite. We offer customized labeling at an very low cost compare with services gave everywhere throughout the nation. Our Self-Adhesive Sticker Labeling Machine has its very own extraordinary single point like synchronized speed control framework and Flexible several drive application gives. The container labeling machine has Inbuilt Automated Label Length discovery frameworks that disposes of the requirement for physically bolstering and putting away of Label Length information in memory and recovering the equivalent each time for change of Label estimate and re-beginning the machine. This thusly spares significant time, staying away from machine-down time, and accomplishes higher generation. The automatic vertical container label applying machine is a standout amongst the most clients neighborly. The Machine joined with most recent SERVO or refined Micro Processor Control Label apportioning framework with easy to use Sensing framework for Label and Product. It is appropriate for sticker labeling on flat container. It is ability of label is up to 300 Products for each moment relying upon items measurement and label estimate. Our model – 60/120/150/250/300/400/600 Bottle per minute depend application and frameworks. Speed Per Minute Up to 80 tube per minute (Speed Depends up on the Size of the Product and label length). Bottle Holding Unit Belt Type Spring Based Top Conveyor. S. 304 development including principle machine outline. “No Container – No Label” an electronic detecting gadget stays away from wastage of marks. 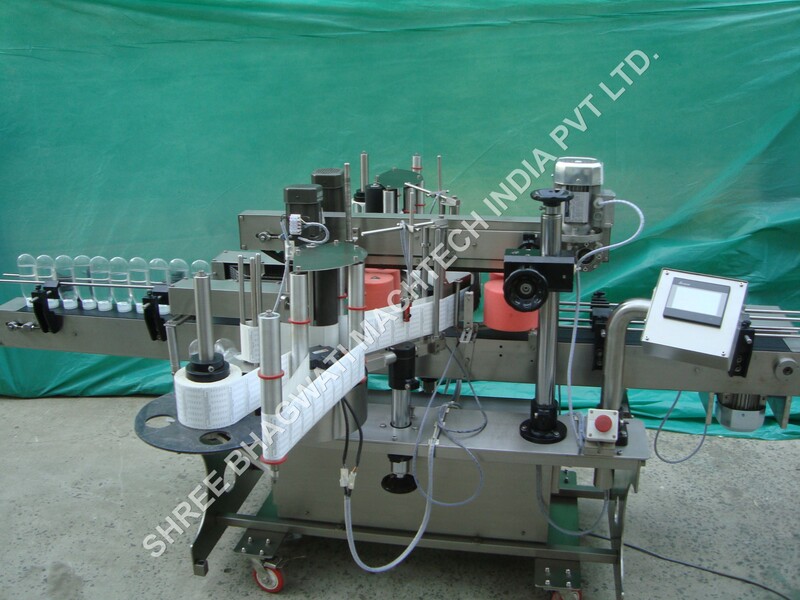 Machine is reasonable for round holder for fold over naming with the assistance of Change Parts. Top Conveyor to holding item at the season of marking. Label Roll Empty – Machine Stop System with Alarm. Missing Label in Roll – Machine Stop System with Alarm. Special Label Sensor for detecting Transparent Film Labels which does not have any detecting imprint on it. Option of Contact Coder, Hot Foil Coder, HP Cartridge Coder and Inkjet Coder with different speed ranges accessible. Tower Light demonstrating the machine status/task. Color or Mono Touch Screen with PLC for machine task and indicating different mistake messages and data in plain view. Special Sensing framework for checking missing mark on item. Low Compressed Air – Machine Stop with Alarm framework for pneumatically o-worked coding framework. Vision System for checking Barcode, nearness or nonattendance of Coding or pharma code on marks. Vision System with OCR framework for checking coding on marks. Online pneumatically worked item dismissal framework. Polycarbonate Enclosure in Stainless Steel Profile.